The Portland Trailblazers failed to reach the postseason in any of their first six seasons in existence, and have managed to do so just twice in the past seven. And in the 27 seasons (1976-77- 2002-03) in between? 26 trips to the postseason, 24 .500-or-better seasons, six conference finals appearances, three conference titles and an NBA championship. In other words, one of the most staggering records of consistency and competitiveness you’re going to find anywhere in sports. Consider another interesting factoid: after missing the playoff in each of their first half dozen seasons, the Blazers captured the NBA’s ultimate prize in their first postseason appearance. Unfortunately, this is not all the Blazers are known for. In addition to nearly three decades of consistency sandwiched between a pair of lean stretches, the Blazers are known for catching some tough breaks- no pun intended. Well, maybe a little. Three times in a 32-year span, Portland has drafted a big man with a top-two draft pick, with hopes of entrusting their future to a franchise cornerstone. The first time this happened was in 1974, when the Trailblazers used the first overall pick in the draft on UCLA superstar Bill Walton. 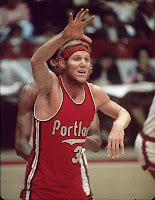 Walton was chronically plagued by crippling foot injuries and never managed to suit up in more than 65 games in any of his four seasons in Portland. And he was the success story! It helps that in those fleeting moments when he was healthy, Walton was an All-Star, an MVP candidate, a champion, a selfless teammate and one of the best all-around centers ever. However, by the start of the 1980s, Walton was gone, having left the team as a free agent after sitting out a season while alleging that the team’s doctors had treated him unethically and incompetently. Despite winning a league MVP award and delivering the only championship in franchise history, fans can’t help but wonder what could have been. A few short years later, the Blazers found themselves in a similar spot, this time picking second in the 1984 draft. With future Hall-of-Famer Hakeem Olajuwon selected with the top pick, and a young stud in Clyde Drexler on the wing, Portland again looked to shore up the middle- you can’t blame them too much, that was formula that worked in the past- passing on a young Michael Jordan and selecting the University of Kentucky’s Sam Bowie, a great passing big man with a history of foot injuries (this may be where you want to dole out some blame). After a rookie season in which he averaged a solid 10 ppg, 8.6 rpg and nearly 3 bpg in 70 games, over the next three seasons Bowie would only take the floor in 66 more games (includes three playoffs games in 1989) for the Blazers. Almost a quarter of a century later, the lottery gods smiled on Portland, as the Blazers landed the top pick in the 2007 draft and were faced with a decision between Kevin Durant, a lanky scoring machine out of the University of Texas and Greg Oden, an old-school 7-footer who’d shown flashes of dominance during a solid freshman at Ohio State. As the saying goes “you can’t teach seven-feet.” With that, the Trailblazers opted for Oden over Durant. Durant gone on to average at least 20 ppg in each of his three seasons, has become an MVP candidate and the youngest scoring champion in NBA history. Meanwhile, Oden missed his entire rookie season with a knee injury, and has managed to take the floor for just a third of the Blazers’ 246 regular season games over the past three seasons. Fortunately for the Blazers, over the three decades for every Sam Bowie or Greg Oden, there’s been a Clyde Drexler, a Terry Porter, a Jerome Kersey or a Brandon Roy to keep them competitive. Even the exorcism of the Jailblazers- which knocked the Blazers out of the playoffs for five years- was relatively short-lived and well worth the cost, given the incredible positivity that it brought back to Portland. As a Laker fan, I’ve spent most of my life rooting against the Trailblazers and am now mentally prepared for a pair of beatings each season in the Rose Garden. With that said, I, like many, have taken an incredible liking to this team, and would love to see an assassin like Brandon Roy deep in the playoffs. And hopefully the current Blazers squad will catch some (positive) breaks on the injury front and manage to put it all together. However, if history’s any guide, the Portland Trailblazers will once again be faced with a top-three decision between an athletic and versatile wing player and a big guy whose height you can’t teach. Next time, it doesn’t have to be this way! Beginning in the mid-1980s, the Trailblazers handed the reigns to Terry Porter, a solid, young lead guard out of Wisconsin- Stevens Points and the 24th pick in the 1985 draft. During his decade-long tenure in Portland, Porter averaged 14.9 ppg and 7 apg,, averaged a double-double in 1987-88 (14.9- 10.1) and followed it up with three of his best as a pro, when he averaged 17.4- 8.9 and never put up worse than 17- 8. Not only has Porter played at least 200 more games at the point than any other Blazers’ guard, but he remains as the Trail Blazers' all-time leader in assists (5,319) and 3-pointers made (773). He’s second in franchise history in points (11,330) and steals (1,182). 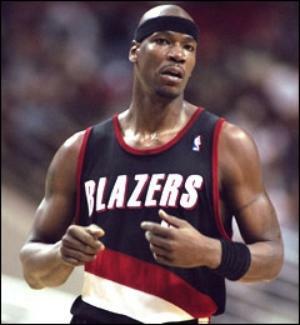 During the height of the Blazers early-1990s success, Porter was also selected to a pair of All-Star teams, in 1991 and 1993. Additionally, Porter led the Trailblazers during their best post-Walton stretch, captaining Portland’s NBA Finals teams in 1990 (fell to Detroit in five games) and 1992 (lost to Chicago in six). In his first trip to the Finals, Porter set a single-game Finals record that still stands by making all 15 of his attempts in the Blazers’ Game 2 victory. Always a solid postseason performer, Porter raised his game in his three most successful playoff runs with Portland (1989-90- 1991-92; Finals twice and conference finals once), as he averaged 20 ppg, 7 apg and hit 49% from the field and 84% from the free throw line. In 1992, Porter caught fire from beyond the arc, making 37 of 78 3-pointers (47.4%) in 21 postseason games. Wanna see a clown car of good-but-not-great performers? A parade of guys with stats similar to Terry Porter’s, only without the accompanying longevity or team success? Meet the rest of the Portland Trailblazers point guards! For a 25-year stretch, a bunch of solid lead guards ran the point in Portland. This run began with Kelvin Ransey, who began his career with a pair of seasons (1980-81 and 1981-82) with the Blazers, and put up and very respectable 15.6 ppg and 7 rpg in 158 games. Although the Blazers did reach the playoffs in his rookie season, the following season Ransey gained the unfortunate distinction of being the only Blazers’ point guard to miss the playoffs between 1977 and 2003. Jumping ahead, past the Terry Porter era, we have Rod Strickland, who ran the point in Portland in the early-to-mid 1990s. The Blazers, coming off two Finals appearances in three years, made the playoffs in each of four seasons, but failed to advance past the first round. Individually, Strickland had an outstanding run with Portland, averaging at least 17.2 ppg, 4.4 rog and 8 apg in each of his last three seasons with the Blazers. In total, Rod Strickland averaged 16.2 ppg and 8.2 apg in 312 games, ranking first among Trailblazers PGs in both. The departure of Strickland saw the arrival of Kenny Anderson who, with the likes of Isaiah Rider and Rasheed Wallace, rang the opening bell on the “Jailblazers” era. After a very good 1996-97 seasons (17.5 ppg, 4.4 rpg, 7.1 apg), Anderson was dealt to Boston midway through the 1998 season. In his 127 games in Portland, Anderson averaged a respectable 15.8 ppg, 6.5 apg and 1.8 spg. However, he, like Strickland, was unable to lead the team past the first round of his only postseason appearance with the Blazers. era peaked and alienated some of the NBA’s best fans. It was also under Stoudemire’s watch that Portland missed the playoffs in consecutive seasons for the first time nearly three decades. Not really much of a contest here. As good as Geoff Petrie was and Brandon Roy currently is, it’s going to take an awful lot to bump Clyde Drexler from this spot. In eleven and a half seasons with the Blazers, Drexler built pretty awesome resume: eleven playoff appearances, three trips to the conference finals, two Finals appearances, eight All-Star selections, All-NBA First Team in 1992 and a pair of All-NBA Second Team selections (1988 and 1991). 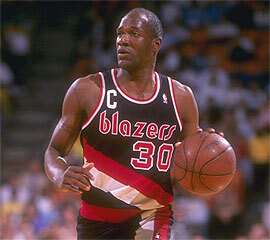 In Trailblazers’ history, no one’s exhibited anything close to Drexler’s combination longevity all-around greatness. Drexler is the franchise’s all-time leader- usually by some margin- in virtually every meaningful statistical category: games played (867), minutes (29,496), points (18,040; no one’s within 6,700 points), FG attempts (14,425), FG made (6,889), FT attempts (4,816), FT made (3,798), rebounds (5,339), steals (1,795) and steals per game (2.1). And wherever he’s not first, he’s not far from the top of the list ranking second in assists (4,933), third in scoring average (21.8) and fifth in blocked shots (594). Drexler’s 6.2 rpg ranks first among all backcourt players in Blazers history and his 5.7 apg ranks sixth, but is the best by a non-PG. A closer look at Drexler’s numbers confirms Clyde’s place among the elite all-around players of his generation. In 1988-89 Drexler produced not only the best seasons of his great career, but his 27- 7.9- 5.8 was achieved only four other times during any players in the NBA from 1983- 1995 (Drexler’s time in Portland)- twice each by Michael Jordan and Larry Bird. That incredible season was not a one-off, but an encore. The previous season, 1987-88, Drexler had shown flashes of this brilliance, putting up 27 ppg, 6.6 rpg and 5.8 apg. Not only is Clyde Drexler the Blazers’ greatest regular season player ever, but he was a spectacular catalyst for the team’s postseason success of in the early 1990s. 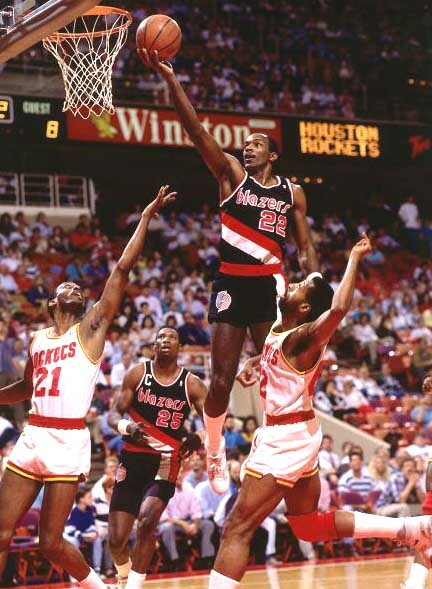 In 21 games in the Blazers’ 1990 Finals run, Drexler averaged 21.4 ppg, 7.2 rpg, 7.1 apg and 2.5 spg. The following season, which saw Portland reach the Western Conference Finals before falling to the Lakers, Drexler put up an awesome 21.7- 8.1- 8.1. Finally, in 1992, en route to another finals appearance, Drexler put together another outstanding postseason, averaging 26.3- 7.4- 7 in 21 postseason games. It’s also important remember that for a few minutes in their respective primes, “Who’s better, Clyde Drexler or Michael Jordan?” was a legitimate question. That the question was aggressively and violently dismissed by MJ in the fist 24 minutes of the 1992 Finals is a bit of negative, but the fact remains that for all of the “next Michael Jordans”- the Kobe Bryants, Grant Hills and Harold Miners- Clyde Drexler is the only player of the Jordan era to seriously call MJ’s superiority into question- for any period of time. Deserving an honorable mention here is the aforementioned Geoff Petrie, the “original Trailblazer” (the “trailblazer Trailblazer”?? ), who averaged 21.8 ppg, 4.6 apg in 446 games over the franchise’s first six seasons. Those six seasons represent Petrie’s entire NBA career, during which he never averaged less than 18.3 ppg or 4.1 apg and three times averaged better than 24.3 ppg. Petrie enjoyed arguably his best season as a rookie (1970-71), when he averaged 24.8 ppg, 4.8 apg was named an All-Star (he was named an All-Star again in 1974) and shared the NBA’s Rookie of the Year with Boston's Dave Cowens. Still ranks third in franchise history in scoring average, sixth in points (9,732) and fifth in assists (2,057). Admittedly not a whole lot to choose from here. At first glance it looked as though Kiki Vandeweghe’s 23.5 ppg and 52.6% from the field in 285 games would win out. However, upon close inspection, it becomes clear that all Vandeweghe really did in three full seasons was score a bunch of points for some decent-but-unremarkable Blazers teams- and did so at a time when neither was too big of a challenge. And when I say all this guy did for Portland was score, I mean it. Vandeweghe failed to average 3 rpg in his time in Portland, with a high of just 3.2 per game. How, at 6’8”, do you not grab a rebound more often than once every 12 minutes? In his worst rebounding season with the Blazers, Robinson was more than half a rebound better than Vandeweghe was in his best. Also, while Robinson was not quite the prolific scorer that Kiki was, he was actually pretty good. Consider the following: despite a scoring average with the Blazers that falls short of Vandeweghe’s by more than 7 ppg, Clifford Robinson enjoyed a four-year peak during which he averaged no worse than 19.1 ppg and eclipsed 20 ppg three times. In the midst of that stretch (in 1994, when averaged 20.1 ppg and 6.7 rpg), Robinson also earned himself an All-star nod, which Vandeweghe failed to do with the Blazers, as well as the 1992-93 Sixth Man of the Year award, when he averaged 19.1 ppg, 6.6 rpg and 2 bpg in 31 minutes per game. Robinson was a second-round pick in the 1989 draft and spent eight seasons with the Trailblazers. The Blazers made the playoffs each year Robinson was on the team- though he never managed to match his excellent regular season production in the postseason- and reached the NBA Finals twice (1990 and 1992). In 644 games (4th in franchise history) with the Blazers, “Uncle Cliffy” cracked the top-six in franchise history in blocked shots (726; 2nd), points (10,405; 3rd, first among forwards), minutes played (19,839; 4th), FT made (2,041; 4th) and steals (696; 6th). Also worthy of a shout out here is Jerome Kersey, the franchise leader among forwards in games played. In 831 games played over 11 seasons, Kersey averaged 12.1 ppg, 6.1 rpg, 1.3 spg and reached the postseason every year he played in Portland. Kersey was excellent in the Blazers’ postseason successes in the early-1990s, particularly the 1990 Finals run, during which he averaged 20.7 ppg and 10 rpg in 21 games. Kersey still ranks in the top-five in franchise history in games played (2nd), minutes (21,760; 3rd), points (10,067; 4th), rebounds (5,078; 2nd), steals (1,059; 3rd) and blocked shots (622; 4th). Maurice Lucas’ stat line is solid to be sure, but it doesn’t do justice to his outstanding late-1970s run with the Blazers. In his first three seasons in Portland, Lucas was a regular double-double guy and a perennial All-Star playing alongside the great Bill Walton. More than that, however, “Luke”- one of the toughest players in NBA history- had Walton’s back. He was the thunder to Walton’s lightening as the duo powered the Blazers to the 1977 title. 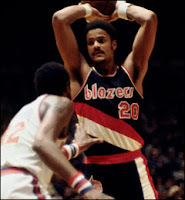 After spending his first two seasons in the ABA, Lucas joined the Trailblazers prior to the 1976-77 season, after the ABA folded. In the 1976-77 NBA season, Lucas averaged 20.2 ppg, a career-best 11.4 rpg and led the Trailblazers in scoring, minutes played, and offensive rebounds as the franchise posted its first-ever winning season and earned its first trip to the postseason. Lucas and all-universe big man Walton made a lasting impression on the NBA playoffs, leading the Trailblazers past the Lakers in a conference finals sweep and losing the first two games of the NBA Finals before upsetting the spectacular, Dr. J-led Philadelphia 76ers in six games. That postseason, Lucas was as much of a monster in the paint as he’d been in the regular season. In 19 postseason games, Lucas averaged 21.2 and 9.9 rpg. Every bit as important as his stats was Lucas’ postseason toughness, especially in the Finals. Late in Game 2, with Sixers on their way to victory, Luas diffused a potential scuffle between Blazers’ swingman Bob Gross and Sixers’ big man Darryl Dawkins, shifting the series’ momentum by physically challenging Dawkins. Lucas remained one of the NBA’s best power forwards in each of the next two seasons, averaging 16.4- 9.1 in 1977-78 for a team that was even better than the previous year’s title-winner. That year the Blazer won 58 regular season games, going a staggering 50- 10 through 60 games. However, they were unable to capture the magic of the previous spring, as injuries to Walton’s feet limited him to just two postseason games and derailed the Blazers’ postseason run in the conference semifinals. Lucas took part in all six of Portland’s playoff games in 1978, averaging a solid 17.2 ppg and 12.5 rpg. The following season, Lucas’ last full campaign in Portland until 1987-88, was a tough one for the Trailblazers. With Walton sitting out the season (never to play for the Blazers again) in protest of the team’s treatment of his injuries, Portland managed just 45 wins and got bounced in the opening round of the playoffs. While the team suffered, Lucas was as good as ever, earning his third consecutive All-Star selection, averaging a career-high 20.4 ppg and 10.4 rpg. Three others are deserving of an honorable mention here. First up in Lucas’ predecessor, Sidney Wicks, the second overall pick in the 1971 draft. Wicks peaked as a rookie, in 1971-72, when he averaged 24.5 pg and 11.5 rpg, was named an All-Star and won the 1972 Rookie of the Year award. Wicks spent four more seasons in Portland- the next three of them also All-Star campaigns- averaging at least 19.1 ppg and 9 rpg each year. Wicks averaged over 20+ ppg in each of his first four seasons with Portland and ranks second in franchise history in both scoring average (22.3 ppg) and rebounds per game (10.3). However, despite his outstanding numbers and four All-star selections, Wicks scoring average declined each of his finals four seasons with the Blazers (interestingly, his scoring average declined from the previous season every year he was in the NBA- nine straight times! ), he never played for either a winning team or an above-.500 team and the year after he left, the Blazers won the championship. Next we have Rasheed Wallace, maybe the most talented PF in Blazers’ history and the personification of the fan-unfriendly teams on which he played a significant role. After spending his rookie season in Washington, Wallace was traded to Portland in exchange for Rod Strickland. Wallace went on to spend seven and a half seasons- all playoff seasons- with the Blazers and averaged 16.8 ppg and 7 rpg in 544 games. Wallace enjoyed an excellent three year prime in Portland, averaging at least 18.1 ppg and 7.4 rpg from 2000-01 through 2002-03. He was named an All-Star twice as a Trailblazer (2000 and 2001) and helped lead Portland to a pair of Western Conference Finals appearances (1999 and 2000). It would be irresponsible to revisit Rasheed Wallace’s days in Portland without recalling his penchant for getting T’d up. While he didn’t actually put the “jail” in “Jailblazer,” ‘Sheed’s petulance assured that he was never an outcast on those teams. In 1997-98, he set an NBA record with 38 technical fouls, a mark he would quickly shatter with 40 technical fouls the following year, and top again in 2000-01, with 41. In 2003, Wallace was suspended by the league for threatening then-referee Tim Donaghy after a home game. Finally we have the anti-Sheed, Buck Williams. After spending his first eight NBA seasons in NBA purgatory with the New Jersey Nets, Williams was traded to Portland in the summer of 1989. One of the best role players of his era, Williams stepped right into the Blazers’ squad, averaging at least 11.3 ppg and 8.8rpg in his first three seasons with the team. Not coincidentally, after four straight first round exits, the talented Blazers took their game to new heights with the hard-nosed Williams. Portland reached the conference finals three times and the Finals twice in Williams’ first three seasons. He remains the franchise leader in FG percentage (55%) and ranks fourth in Blazers’ history with 4,861 rebounds. It’s rare to see an athlete who achieved less with a franchise that’s more identified with that franchise and revered by its fans. It’s rarer still that said athlete is fully deserving of every ounce of love and respect that is bestowed upon him. In many ways, Bill Walton’s resume with the Trailblazers is a bit underwhelming. In four seasons with the franchise, Walton played just 209 games- and average of just 52 per season and never more than 65 in any one season- and ranks 27th in franchise history in points, 13th in rebounds and seventh in blocks. With that said, a healthy Bill Walton was one of the greatest big men the game has ever seen and meant as much to the Trailblazers as almost any player’s ever meant to a franchise. His prime was fleeting, but brilliant. Walton is, and has always been, a basket genius. The consummate winner, an incredible teammate and with the possible exception of fellow John Wooden disciple Kareem Abdul-Jabbar, the best passing big man in NBA history. In each of his “healthy” seasons (his last three in Portland, in which he played between 51 and 65 games), Walton averaged at least 16.1 ppg, 13.2 rpg and 3.8 apg, was twice named an All-Star (he only played once, posting 15- 10 in the 1978 game) and 1977-78 complemented that honor by earning an All-NBA selection and capturing the league’s MVP award. After early round wins over the Chicago Bulls and the Denver Nuggets, Walton held his ground against Kareem as Portland swept the Lakers in the conference finals, and was pivotal in the Trailblazers’ NBA Finals triumph (he was named Finals’ MVP) over the favored Philadelphia 76ers- a feat made more impressive by the fact that Portland earned four consecutive wins after losing the first two games of the series. If the 1977 champs were the NBA’s ultimate Cinderella story, the 1977-78 version had the look of one of the NBA’s best-ever units. The Blazers powered out of the gate, winning 50 of their first 60 games. However, his Blazers looked ready to explore the limits of their potential, Walton’s career in Portland was effectively brought to a fittingly frustrating end, as a broken foot cut his season short and limited him to just two postseason games. In a testament to his greatness that season, Walton won the league MVP and was named to both the NBA's First All-Defensive Team and the All-NBA First Team, despite playing in just 58 regular season games. After averaging 13- 11 in two postseason games against Seattle- a series won by the Supersonics in six games- Walton reinjured his foot and, though no one knew it at the time, would never suit up for the Trailblazers again. He demanded a trade in the offseason, citing unethical and incompetent treatment of injuries by the Blazers' front office and medical staff. Walton ultimately chose to sit out the 1978-79 season- the last of his contract- in protest, before signing with the San Diego Clippers as a free agent in 1979. As imperfect as Bill Walton’s time in Portland- and his ultimate exit- may have been, he was the emotional and physical engine that brought the Portland Trailblazers to prominence and carried them to the game’s ultimate heights.